Hundreds of bird species call the Midwest home at some point in the year. Each species has its own system to survive the winter. Ospreys leave the area and head to Central or South America. Great Horned Owls are well-equipped to endure our cold temperatures and stay on their territories. Did you know that the Midwest is the southern destination for some birds? Snow Buntings, Lapland Longspurs and American Tree Sparrows all head south to Minnesota and Wisconsin for the winter. This winter we are playing host to large visitors from the far north…Snowy Owls. These huge white owls are ‘irrupting’ into southern Canada and the northern United States. The irruption is most extreme in Eastern North America with a report of 150 different Snowy Owls seen in one day in Newfoundland. There was even a Snowy Owl reported in Bermuda. What is an irruption? It is an irregular movement of a large number of birds, or animals, to an area where they aren’t typically found in such high numbers. Snowy owls and other northern, non-migratory, owls often move southwards to find prey when the food sources in their home range decline. This winter the Snowy Owls that are arriving in Eastern U.S. appear to be well fed and in good health, so they may not be leaving due to low food supplies as reported in this live science article. 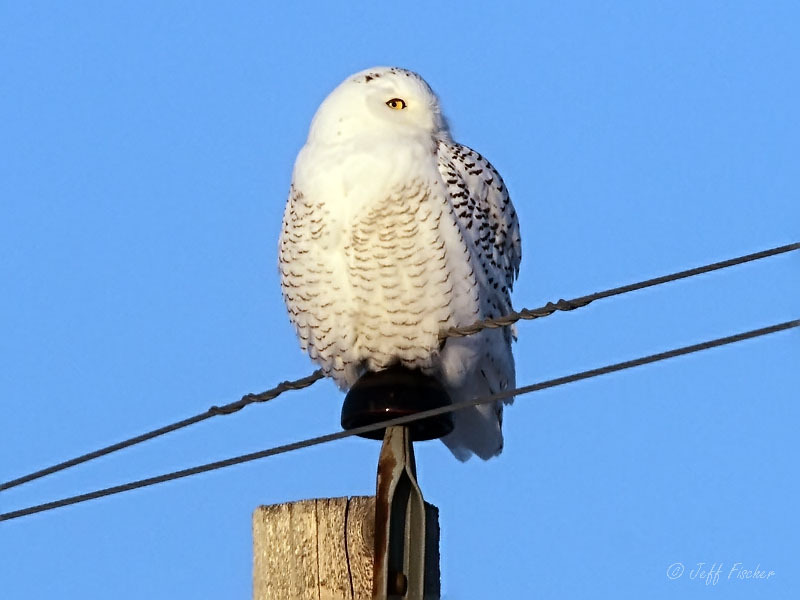 There have been a few Snowy Owl reports from our area, with one reported south of Hastings on December 28th. If you do go out to look for Snowy Owls, make note of the amount of black barring on the bird. Older owls have less barring than younger birds. Males have less barring then females. A pure white owl should be an older male while a heavily marked Snowy Owl is most likely to be a young female. Observe the owl from a distance and report any Snowy Owl sightings to ebird.org so that scientists can track this magnificent species to learn more about Snowy Owl conservation.